1793 and Europe is ablaze with war. Thomas Paine Kydd, a young wig-maker from Guildford, is seized by the press gang to be a part of the crew of the 98-gun line-of-battle ship Duke William. The ship sails immediately and Kydd has to learn the harsh realities of shipboard life fast. Despite all that he goes through in danger of tempest and battle he comes to admire the skills and courage of the seamen - taking up the challenge himself to become a true sailor. Kydd is the first book in the acclaimed series, and is based on real events. 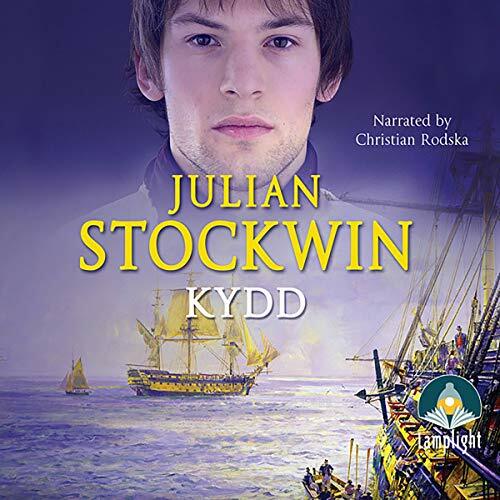 ©2001 Julian Stockwin (P)2014 Audible, Inc.
What did you love best about Kydd? Interesting plot. You see life from a sailor's, not officer's, point of view. What other book might you compare Kydd to and why? Dewy Lambdin's series - although Lambdin is better. Where does Kydd rank among all the audiobooks you’ve listened to so far? This story is a nice variant of the English naval fiction of the Napoleonic age. Most of those stories are told from the perspective of an officer, usually the captain. Telling the story from the perspective of a pressed landsman is an interesting variation. Would you listen to Kydd again? Why? Yes, I am anxious to start book two. The adventure was exciting and engrossing - reels you in and keeps it interesting. Not too much "fluff", which seems to be prevalent in several of the books I've listened to. What does Christian Rodska bring to the story that you wouldn’t experience if you just read the book? Excellent voices - great interpretation. Who was the most memorable character of Kydd and why? Thomas Kydd is the main character of course, and naturally the most memorable. I enjoyed this book a great deal - but be forewarned - it contains a lot of sailing/nautical nomenclature of the period, and it does not go into what any of it is. As I was not familiar with those terms it made it a bit challenging to follow at times. Also, one other small criticism is that sometimes the scenes (or particular parts of the story) seem to get truncated leaving the listener wondering what happened. Don't let these things scare you off though, I'm a tough critic, and I enjoyed this book very much. I had almost lost interest in the Old Naval stories. This one woke up my interest again. The story of the hard life of an ordenary seaman, and not an officer like similar books. It’s a good sea story, but drags at times. Lots of nautical terminology that can be hard to follow. It is a good book to get lost in. Excellent narration. Main character is not to be confused with the pirate William Kidd. This is not a pirate story. I began my sojourn into the world of English tall warships years ago with Patrick Obrien, then had to move on to C. S. Forester and now I have discovered, with joy, a new series of equal authenticity, imagination and eloquence in the Thomas Kydd series by Julian Stockwin. Thank you Julian for allowing me to escape again into an incredible world that never ceases to amaze me. I am now thoroughly hooked, after finishing the first four books in the series. I have avidly consumed the Aubrey/Maturin series, the Ramage series, and the Hornblower series. This opening book promises something similar, but is critically different insofar as the protagonist is a pressed "foremast Jack," rather than the captain (or cimmander). I enjoyed this book and, as in the Hirnblower series, Rodska was an excellent narrator. This is where it all start for Thomas Payne Kydd, a wigmaker from Guildford who is press-ganged into service with Her Majesty's Navy. What ensues from here is a long-running series of genuine quality by an author who not only writes a thrilling yarn with engaging characters but who also knows his subject in great depth. This novel introduces Kydd in the hardest of circumstances as a pressed man and follows him as he struggles to come to terms with a life at sea and the brutal rules that apply to it. It also introduces the highly enigmatic Nicholas Renzi. As a first book in the series it is not without its issues. The naval terminology is borne from deep knowledge but can confuse the layman (like me) at times. The book is fairly derivative of other naval historical fiction and the characters clearly need more investment before we see them become fully rounded. Though in fairness, the character of a pressed man would be either one of a defeated man from the start or would take time to develop. This may sound slightly critical but peruse the reviews of the rest of the series and it's easy to see the quality that Stockwin brings to bear. The book itself is still highly enjoyable. What is undoubted though is that Christian Rodska hits the right tone right from the very beginning and does a superb job of the narration. This has become one of my favourite series in the genre. If the above seems critical and you like this kind of fiction I would say don't be put off. This is just the beginning and when all is said it's a more than decent start! What does Christian Rodska bring to the story that you wouldn’t experience if you had only read the book? Knowing some of the characters are in future books it is hard to feel too much when a character is going through a possible hazardous situation. Looking forward to my next book. fast gripping naval story. it had me on the edge of my seat. highly recommend. The story was very good a bit like a Sharpe of the Sea. If you have read Hornblower you will enjoy the setting and characters. However the excellent narration by Christian Rodska makes listening an absolute pleasure. I just hope the exciting storyline is maintained through the other novels. Starting the next novel straight away. Had potential but it's like the author didn't know how to bring any of the sub plots to a satisfactory end, then gave up on the end itself. After finishing the Hornblower books, now my favourite all time books. This is a great way to quench my thirst for naval action. I loved this book and some very detailed nautical terms with good explanations. Looking forward to the next. I have read and re-read the Hornblower books so Stockwin had a lot to live up to. In this regard he was moderately successful. The writing is good, as are the characters and the narrator is fantastic. "Kydd" does however feel a little disjointed, like a number of short stories which were smashed together. The stories themselves arent bad but just the way in which they are linked leaves much to be desired. Some of the chapters are exciting and inspired me to listen on whereas others felt long and drawn out. This contrast between action and inaction exists in all literature but I feel like Stockwin, in this first book, fails to keep the readers attention during the necessary but less exciting parts of the book. I will listen to the next in the series and hope that chapters blend more seamlessly, that the excitement continues and that the slower parts are more skillfully dealt with. Not a bad effort but perhaps not for people new to the naval adventure genre.